Once just a cute novelty, ballpark food has become its own art form. 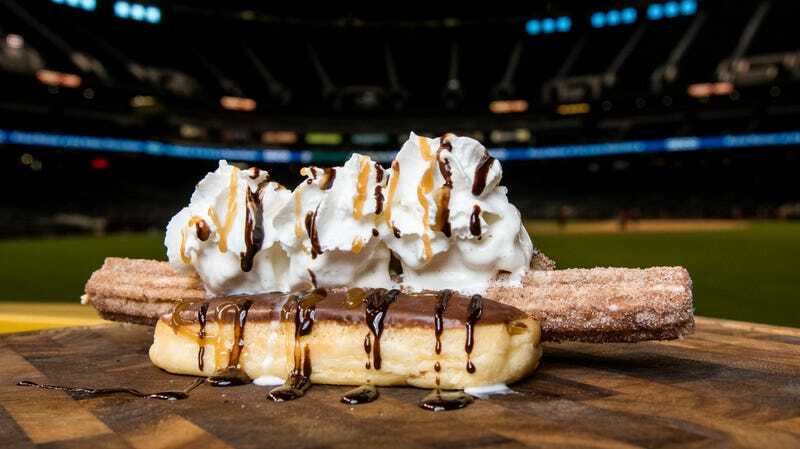 Major League Baseball teams roll out their annual menus with about as much fanfare as they do the actual players, competing to one-up each other in terms of audacity and cheese-sauce-per-square-inch. Until now, you’d have to travel around the country if you wanted to sample all the foot-long, deep-fried wares. But Major League Baseball’s new FoodFest—taking place in L.A., New York City, and London—will unite all 30 teams’ stadium food under one roof. The festival was in New York last year, and sold out in 48 hours. The festival kicks off in April in L.A., with ticket prices ranging from $45 to $90. The $45 tickets get attendees eight food items and unlimited non-alcoholic drinks; the cheapest booze-included tickets start at $60 and include the same food and non-alcoholic drinks, plus three beers. Anheuser-Busch is the official “presenting sponsor” of the festival, so the brewer will offer suggested beer pairings for each of the foods. The fine print notes that all ticket prices are for a two-hour window, so hopefully you’ve been practicing your speed eating. The festival website doesn’t include a complete menu, but does promise food representing all 30 ballparks, specifically calling out Arizona Diamondback’s Churro Dog, the Seattle Mariners’ toasted grasshoppers, and the L.A. Dodgers’ chicken-chile-yam-topped Sisig Fries. The Los Angeles Times has further details on certain teams’ contributions, including Boston Red Sox’s lobster rolls and Philadelphia Phillies’s cheesesteaks. Obviously, it’s all one giant marketing event for Major League Baseball, as the event’s website makes clear with lines like: “The indoor décor will include food-inspired activations and interactive exhibits perfect for your Instagram feed.” I’m not sure the sight of me stuffing eight versions of loaded fries and churro dogs into my mouth in two hours is something people need to see on social media, but to each their own.